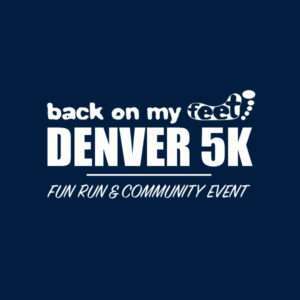 Join Back on My Feet in Denver on Sunday, April 28th for our first 5k race in the community! At Back on My Feet, we use the power of running as a catalyst to empower individuals to achieve self-sufficiency. The Back on My Feet Denver 5k is an untimed fun run and fundraising event to support the Back on My Feet program. And this year it fuels the launch of Back on My Feet in Denver! Dog friendly and family friendly for strollers and small trikes/scooters. Join us to run, walk, and learn more about the Back on My Feet community. It’s not about speed, it’s about moving forward. Registration is $25 and includes a race t-shirt* and eligibility for prizes. *Extra shirts will be ordered for those who registered after April 14th but will be handed out on a first come, first served basis. Online registration will close Friday, April 26. You don’t want to miss out! We’ll be running rain or shine. There will be no refunds/exchanges, and there will not be a backup date in case of severe weather. Join us for a full morning of fun! After the run, we’re continuing the fun at Tap & Burger Sloan’s Lake. Join us for food and drink, an opportunity to win prizes and community. Hope to see you there! Interested in Sponsoring the 5k? We would love to talk to you! Please reach out to Ashley Kilpatrick at ashley.kilpatrick@backonmyfeet.org. Hope to see you in April!